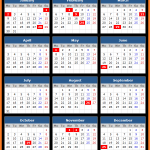 Check Mauritius Public Holidays for the calendar year 2017. Check 2017 holidays dates for New Year’s Day, Chinese Spring Festival, Abolition of Slavery, Thaipoosam Cavadee, Maha Shivaratree, Independence and Republic Day, Ugaadi, Labour Day and Eid-al-Fitr. ** The exact date of this festival is subject to confirmation as its celebration depends on the visibility of the moon.